(CN) – President Donald Trump told a Utah senator that he will shrink two national monuments in the state during a phone call Friday morning. Trump told Sen. Orrin Hatch that he will shrink Bears Ears National Monument, designated by President Barack Obama, and Bill Clinton-designated Grand Staircase-Escalante National Monument. “I’m approving the Bears Ears and Grand Staircase recommendation for you, Orrin,” Trump said in a Friday morning phone call, according to Hatch’s press secretary Matt Whitlock. White House Press Secretary Sarah Huckabee Sanders confirmed Trump will travel to Utah in early December to make a formal announcement regarding the monuments, but declined to provide details on the nature of the reduction. “I’m not going to get ahead of the specifics of the president’s announcement on that,” she said during Friday’s White House briefing. Trump is following recommendations compiled by Interior Secretary Ryan Zinke, who undertook a comprehensive review of more than 27 national monuments and marine sanctuaries. In September, Zinke recommended reducing the borders of four national monuments, including the two in Utah, Cascade Siskiyou in Oregon and Gold Butte in Nevada. Environmental organizations were swift in their condemnation of Trump’s anticipated action. “President Trump is making it clear that he stands with the most partisan and anti-lands faction of his party, not the majority of Americans,” Wilderness Society President Jamie Williams said in a statement. Bears Ears encompasses 1.3 million acres of territory in San Juan County in southeastern Utah. 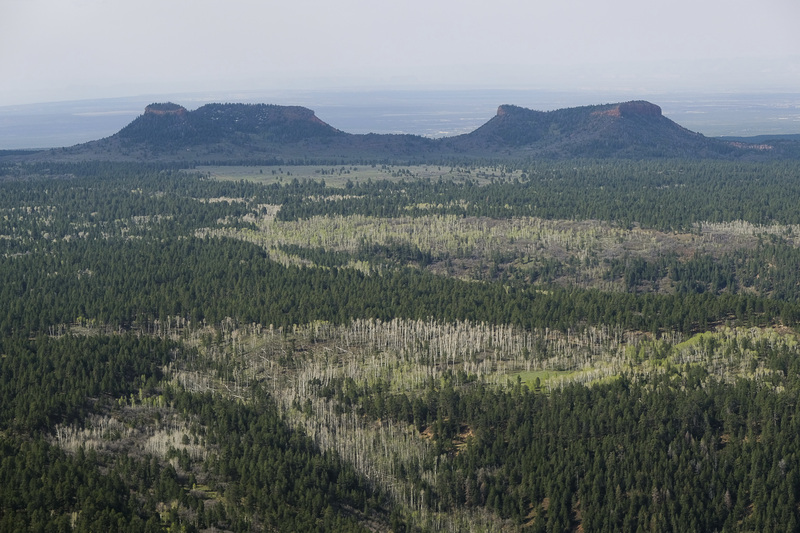 The monument preserves a large swath of natural resources that surround the main natural feature of the area – a pair of mesas that resemble two ears of a bear. The land also contains several examples of ancient artifacts from ancient Native American tribes and is considered sacred to tribes including the Navajo, Ute, Pueblo and Hopi. Obama designated the national monument, one of the largest by land mass in the nation, on Dec. 28, 2016, just weeks before leaving the Oval Office. The designation was immediately denounced by the Utah congressional delegation, including Hatch and Rep. Rob Bishop, the chairman of the House Natural Resources Committee. Bishop, in particular, has long criticized federal management of lands in Utah, saying it takes decision-making out of local hands and places it with bureaucrats in Washington. He and other mostly conservative voices on the issue say setting aside vast tracts of land for purely conservation purposes is outside the scope of the Antiquities Act, which vests presidents with the authority to designate national monuments. But critics say the rhetoric surrounding presidential overreach and local concern is just posturing, and that the real agenda is to make federal lands available to ranching, mining and fossil fuel development. Bureau of Land Management documents show oil and gas companies have explored land within the Bears Ears National Monument and found vast deposits of hydrocarbons, currently off limit for development. While environmentalists make counter-arguments citing climate change and the environmental damaged caused by drilling, mining and natural resource extraction, a growing number of people say the economic boost from outdoor recreation more than offsets whatever loss is incurred by curtailing natural resource extraction. The Outdoor Industry Association says outdoor recreation accounts for $646 billion in spending per year, and notes that industries like mining and natural resource extraction create temporary jobs while outdoor recreation provides more sustainable opportunities. “The proposed shrinking of both Bears Ears & Grand Staircase-Escalante National Monument is an affront to American outdoorists & businesses,” the organization tweeted Friday in reaction to the news. Grand Staircase-Escalante protects 1.8 million acres in southern Utah and is filled with spectacular plateaus, gulches, canyons and natural arches. The monument is also rife with fossils including several distinct kinds of dinosaur bones. The exact size and specifications of the reductions have yet to be revealed by Trump or Zinke. Several public lands advocates, environmental organizations and Native American tribes have threatened lawsuits if and when Trump moves forward with the monument reductions.